The Parthenon Company Blog - Specialists in Wound and Ostomy Supplies: What Is InterDry Ag Used For? What Is InterDry Ag Used For? InterDry is used to eliminate skin on skin irritation and inflammation. People have skin folds or places on their body where skin touches skin. These places of contact are ideal for a type of skin rash, called Intertigo*, that thrives in hot and sweaty places on where skin rubs skin. Typical places that are vulnerable to this rash include: stomach folds, under the breasts, groin and armpit area. In addition to this rash, odor, itching and burning can also manifest coming from bacteria, yeast and fungus. 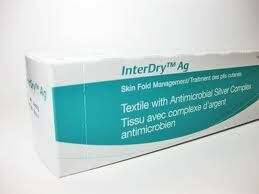 InterDry is a moisture wicking fabric containing antimicrobial silver. The fabric wicks away moisture so your skin stays dry and helps eliminate skin-on-skin friction. And the antimicrobial silver in the fabric fights itching and odor-causing bacteria so you can be active, comfortable and confident all day. * Intertrigo, (ITD) is an inflammatory dermatosis of opposing skin surfaces caused by moisture Journal of Wound Ostomy Continence Nursing. 2011;38(4):359-370.